UVA student publications grapple with the same print vs. online issues that preoccupy the rest of the newspaper industry. The Cavalier Daily and the Declaration, two of the more prominent student publications on Grounds, increasingly rely on the web to reach readers. Even so, neither has abandoned newsprint entirely. You could describe its readers as digital-first too. The CD commands 18,700 Twitter followers, 6,000 Facebook likes and 4,000 email subscriptions. Its website attracts about 10,000 page views per day. Compare those numbers to the CD’s print circulation, which is 7,500 copies, less the significant portion that remain untouched in their news racks. Which leads to the question at hand: With such a large online presence, why continue to print? Bernstein offers a couple of reasons. The first is experiential: the desire and commitment to give a talented art and production staff the opportunity to create a printed newspaper. The second is more practical—and more typical of the newspaper industry in general. “From a financial perspective, the print paper is our main source of revenue,” Bernstein says. That’s not to say it’s the only source. 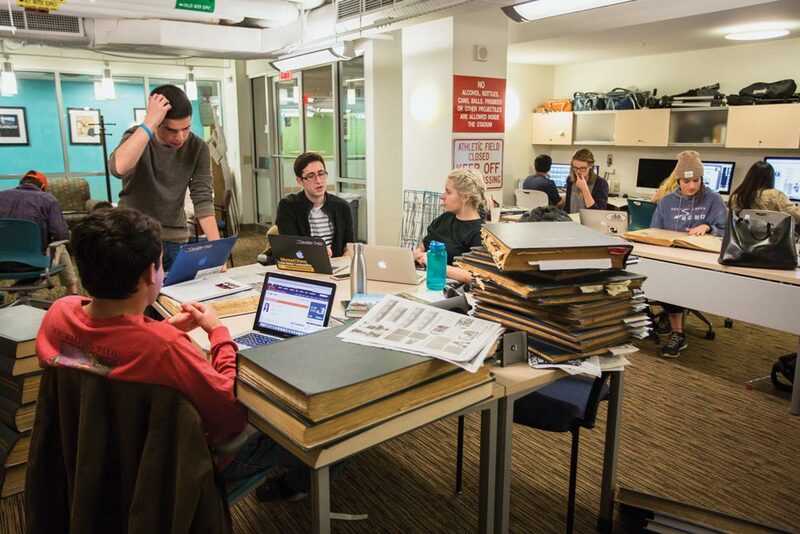 Working on the same floor inside Newcomb Hall—across a wall, in fact—is the Declaration, an alternative-style publication with a penchant for satire. Editor-in-chief Melissa Angell describes it as a “mesh between the New Yorker and Vanity Fair, but UVA-centric.” Founded in 1973, it’s a much smaller enterprise than the CD. It has an editorial board of 10 to 15 students, plus another 10 to 15 regular contributors. That compares with a 250-member staff for the Cavalier Daily. The Dec distributes 500 print copies across Grounds as part of its semi-monthly publication cycle. Like the Cavalier Daily, the Dec used to publish more frequently; it was weekly as recently as 2007–2008. And, also like the CD, it gets more readers online than in print. Angell says the most popular articles can get 2,000 to 3,000 page views, compared with 400 to 500 for more typical fare. Just an FYI, but I was on the staff of The Dec from first year through fourth year, when I served as executive editor (fall 1979 through spring 1983). The Dec was weekly then and had been, I’m pretty certain, from the start. The article implies, though doesn’t state, that the weekly print schedule was a relative recent thing prior to the 2007-08 ... just wanted to clarify that.